Contracting an online poker affiliate can be a ‘make or break’ move for any fledgling online casino. When getting off the ground, affiliate marketing poker can that much needed kick in the visitor count’s backside that convinces serious players to give the new kid on the block a try. It can also be a great way to see how well your advertisers are working to get your casino’s name ‘out there’. With a trackable link, any casino can quickly log in and see just how many times people gave not only clicked through as a result of the affiliate link, but also how many of those clicks have resulted in a sign up; from there on, sign ups to deposits, and deposit amounts can all be looked at. Simply put, if an online poker affiliate is doing their hard work and hitting the right places, you’ll know pretty quickly. There is also the more basic benefit of having an affiliate. They do all the leg work. Anyone running a casino online either has a dedicated advertising and marketing department, or at the very least, has to outsource it. With an affiliate, their payment depends on getting people to visit their target site, or in many cases, sign up before the casino is required to hand over a penny in revenue. Therefore, once they’ve signed on to take on the task of getting hits, you can be sure that they are going to put every spare minute into working that affiliate link. It’ll be all over industry specific forums, embedded in effective banner ads, social media…you name it. If the affiliate is on a ‘per click’ deal, they’re going to get to work. How can that not make more sense than hiring a department that may or may not yield increased traffic to a new casino? However, there are also some considerations to be made when picking an affiliate. These are not pitfalls, more just some cautionary thinking points. The main point is actually picking an affiliate who is up to the job. As previously mentioned, an affiliate’s job is to get out there and promote the client proactively. Making the decision as to which affiliate to entrust with your traffic boosting is never going to be an easy one; there are a litany of small operations and startups out there, all promising to direct huge volumes of traffic your way. 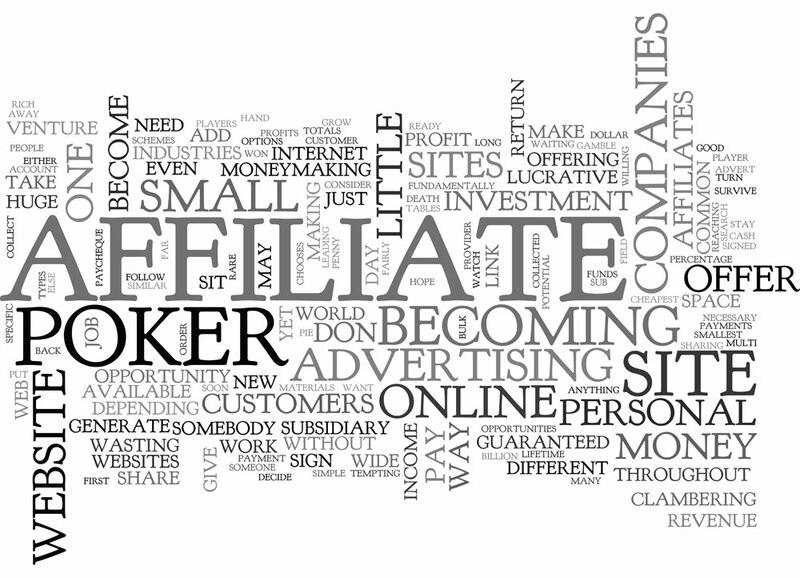 One of the best things to look for is an affiliate who specialises in poker related advertising and marketing. As an online casino offering poker as a main attraction, it would be pointless entrusting the job to an affiliate who is more of a general marketer. The affiliate needs to be poker focused, with a knowledge of buzz words, as well as a clear idea of where they will be focusing their efforts. Is it going to be through banner ads to mailing lists of known poker players? Will it be a social media campaign? The second consideration is to actually get the affiliate to get your message across, not theirs. Any online poker affiliate will know that their message needs to reflect their client’s. It may be well and good to plaster affiliate links on Instagram and Facebook, but if the client wants to have a more focused approach around customer databases, for instance, then finding someone who knows how to run an affiliate campaign for the client, rather than a run of the mill campaign (which may be in the client’s best interests, but still not what they asked for) is going to be a task in itself. Overall, poker affiliates are an excellent complement to any casino’s marketing strategy. But the important thing to remember here is that it needs to be a directed, focused approach that not only brings in cash for the affiliate, but gets the right sort of traffic. No poker based casino wants casual Blackjack players, for instance. A Google search will bring up plenty of affiliate chancers, but its easy to spot the wannabes from the real thing. Consider using a reputable affiliate marketing firm for your traffic; the costs may be higher but revenue will be drastically increased as a result.